Editor's note: This article has been reformatted for the SABR website. Click here to download a PDF file of this article to read it in its original format. These glass plate negatives are housed in underground “cool storage” at the Chicago History Museum (CHM). This collection had been known as the Chicago Daily News photo morgue. It was donated to CHM by the Marshall Field family over fifty years ago. Cataloging of the photos based on information in a card catalogue plus notes scratched on some of the negatives occurred in the 1990s. About one-third of the collection (roughly 1901-1933) was digitized and saved on CD-ROM during that time. By the late 1990s the images were made available online. The American Memory – Library of Congress website that for over a decade provided a familiar window into the collection is no longer supported by the Federal Government. However, images from the negatives can still be accessed online at: www.chsmedia.org (click on “advanced search”). The number of “baseball” photos is surprising large – 14.1% of the digitized portion of the collection. This seems to indicate a high level of public interest in the sport during the time span covered by those images. In addition to major league baseball coverage, the collection includes large numbers of semi-pro, college, high school and other amateur team photos. There are also some images of black players, including photos of the Chicago Union Giants. The Federal League photos include some interesting 1913 shots of Chicago players, one year before the FL attained major league status. The images may be downloaded at no charge in low/medium resolution. High resolution scans are available for $50.00 each. Photos from the collection have frequently appeared in SABR publications. This is clearly a fabulous resource for historical baseball images. The vast majority of photos appear to be correctly identified. Player names inscribed directly on the glass plates appear to be remarkably accurate. (In contrast, for the Library of Congress Bain collection, vintage inscriptions on photos are less reliable.) However, not all the CHM plates have player IDs inscribed upon them, and a significant number of those photos are either misidentified in CHM records, or are captioned as unknown but are easily identified. There are also quite a few minor misspellings and date errors. Most errors likely came in through the card catalogue that accompanied the negatives when they were donated to CHM. It may be noted that team shots lack individual player IDs, and also that the given date span of the photos in the title of the collection is not quite right. 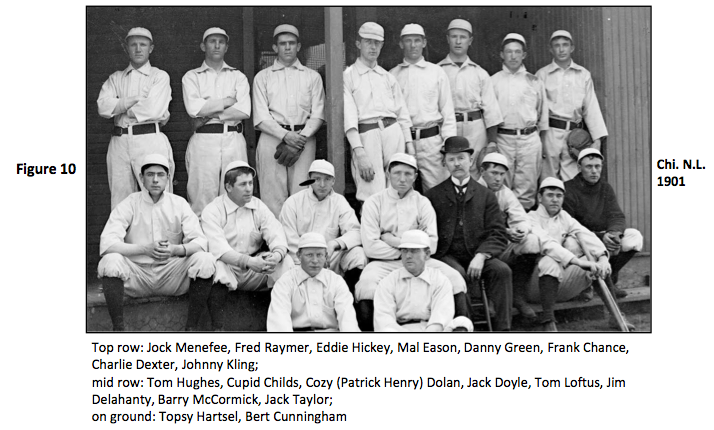 There are baseball photos that certainly date to 1901, one year earlier than expected. We will address a small number of interesting cases in this article. This will include some insight provided for a particularly valuable photo. We will also include a table of caption revisions compiled by a few Pictorial History Committee members since about 2003. This table is by no means claimed to be complete, but it does provide a good starting point for a more comprehensive review in the future. The value of such photo collections to researchers is enhanced when one actually knows who is depicted. All photos appearing here are courtesy of the Chicago History Museum unless otherwise noted. The above mentioned ID errors are understandable given that archvists and museum cataloguers are usually not familiar with Deadball Era ballplayers. That said, the results can at times be amusing when several photos are considered together. At the left in Figure 1 is displayed SDN-000218 from the CHM collection. therein captioned as Jim St. Vrain, who appeared briefly for Chicago N.L. in 1902. Exemplars of St. Vrain are shown right (from the 5-1-1902 Chicago Tribune) and center, this one (SDN-000216) correctly identified in the CHM collection. Clearly SDN-000218 is not St. Vrain. In fact SDN-000218 is a depiction of Fielder Jones, then of the White Sox. This is supported by an ear comparison with a correctly identified 1914 Fielder Jones exemplar (SD-059933 from CHM) that yields a virtually perfect match. See Figure 2. Note that we will eschew further forensic-style isolated feature comparison in the remainder of this article (though we will present a few simple side-by-side face comparisons). One can assume that each ID asserted has been carefully considered and verified. In Figure 3 the now correctly identified Fielder Jones appears at left. At center we have SDN-003677 currently identified as Davy Jones, and SDN-002180, right, currently listed as Fielder Jones. In fact the former actually depicts Fielder Jones, while the latter is Charlie Jones in 1905, his only year in Chicago2. The Figure 3 captions here should undo any remaining confusion. 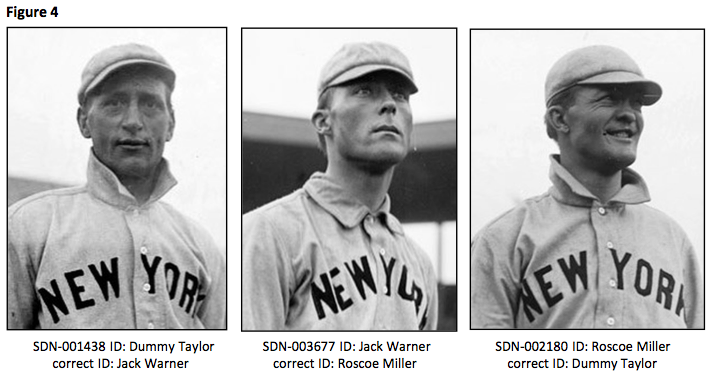 The three 1903 Giants in Figure 4 are currently listed as, left to right, Dummy Taylor, Jack Warner, and Roscoe Miller. That’s the correct trio of names for those three images, only the order is wrong. They are actually Jack Warner, Roscoe Miller, and Dummy Taylor. The three 1903 New York A.L. players in Figure 5 are listed as, left to right, Jack O’Connor, Ernie Courtney, and unknown. 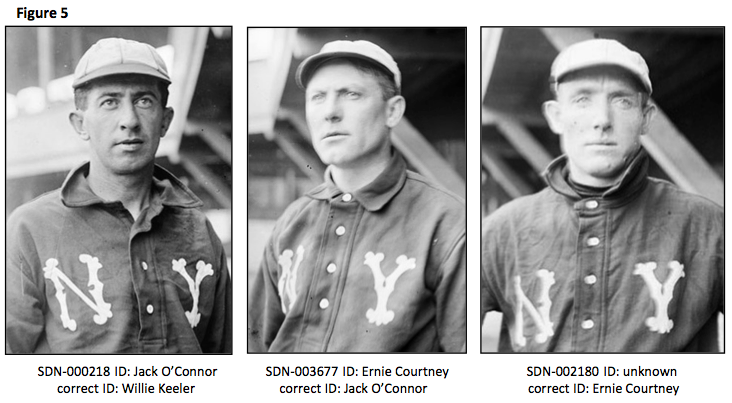 The correct IDs for these images are respectively Willie Keeler, Jack O’Connor and Ernie Courtney. 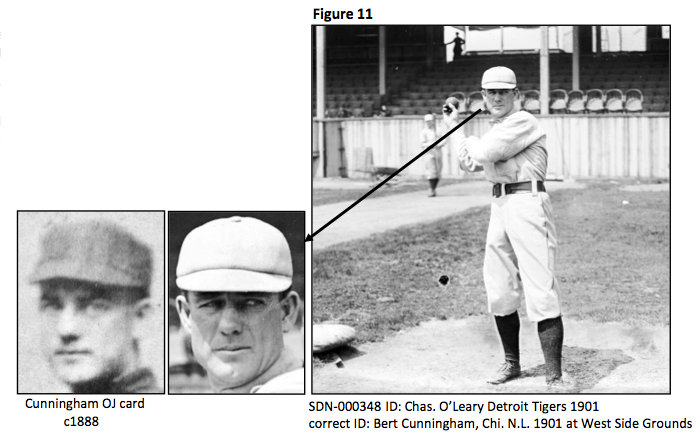 In addition to the above mis-ID for the photo of Willie Keeler, in Figure 6 there are four additional photos of Hall of Famers that are currently unidentified. They are from left to right, George Davis, Clark Griffith, Kid Nichols, and Nap Lajoie. The photo in Figure 7 is a depiction of Herm McFarland as a member of the New York A.L. club in 1903. It is correctly captioned in the CHM collection. Herm had previously spent 1901 and part of 1902 with the White Sox. That probably accounts for the four photos in Figure 8 (1903 far left, the other three date to 1905) that depict White Sox catcher Ed McFarland but are currently misidentified as Herm McFarland. Note that one photo in the collection, SDN-004241 (not shown here), is correctly identified as Ed McFarland. A number of the photos can be dated to 1901, one year earlier than the claimed time span of the collection. 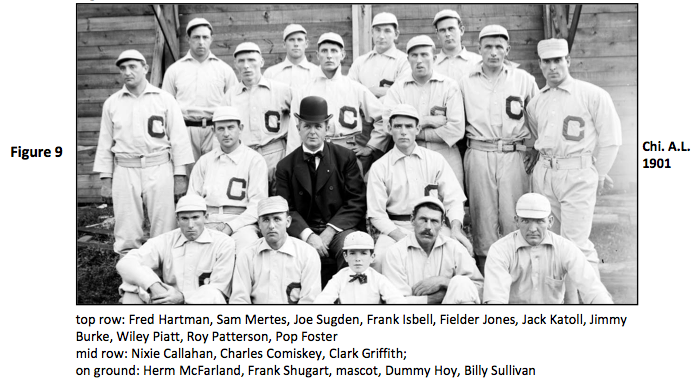 SDN-000250 is currently listed as Chicago White Sox, 1901 (SDN-000904 is another photo from the same session). This is correct, however no player IDs are given. We do not believe this photo has been published with player IDs. They are herein provided below Figure 9. SDN-000312 is shown below in Figure 10. (SDN-000313 and SDN-000314 are photos from the same session.) Although this clearly depicts a different team than that which appears in Figure 9, it is also listed as Chicago White Sox, 1901. In fact it is the 1901 Chicago N.L. club. Player IDs are provided (again we believe for the first time) below Figure 10. There are several interesting single player images from 1901 that are currently misidentified. SDN-000348 is seen in Figure 11, just below. It is currently identified as Charlie O’Leary, however it depicts Bert Cunningham at West Side Grounds. A Cunningham exemplar from about 13 years earlier (his c1888 Old Judge card) is shown just below, left. Cunningham also appears in the team photo of Figure 10. 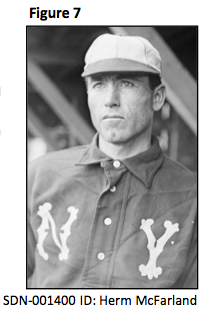 SDN-004748 and SDN-004749 are currently listed as “portrait of Delhanty...1906,” likely referring to Jim Delahanty. These photos actually depict Pete Childs in 1901, his only year in Chicago. SDN-004749 is shown here in Figure 12. He is standing in front of the center field clubhouse at West Side Grounds (the clubhouse was rebuilt with bricks in 1905). Childs exemplars from 1909 and 1901 are shown below left and center respectively. The baseball-sized hole in the wooden door (arrow) is worth noting. The collection also includes correctly identified 1901 photos of Mike Kahoe (SDN-000680, SDN-000681) and Rube Waddell (SDN-000683, SDN-000684) taken from the same location as the that shown in Figure 12. It should be noted that these 1901 photos taken within West Side Grounds are among the earliest that we know of. We have not seen any from the 1890s through 1900. SDN-059782, shown here as Figure 13, is identified by CHM as the A’s Bob Shawkey in 1914, taken at Comiskey Park. That certainly is Shawkey at Comiskey Park wearing an A’s uniform, and he was a member of that club during 1913, 1914, and part of 1915. Let’s see if we can confirm the date. It is not uncommon to attempt to date old baseball photos by analyzing outfield billboard content. Ballpark billboards tend to vary from year to year, but they are fairly stable during the course of a season. Finding newspaper photos that show the outfield advertising is often an effective way to correlate an array of specific ads to a given season. We will try to effectively do the same using only photos from the CHM collection. 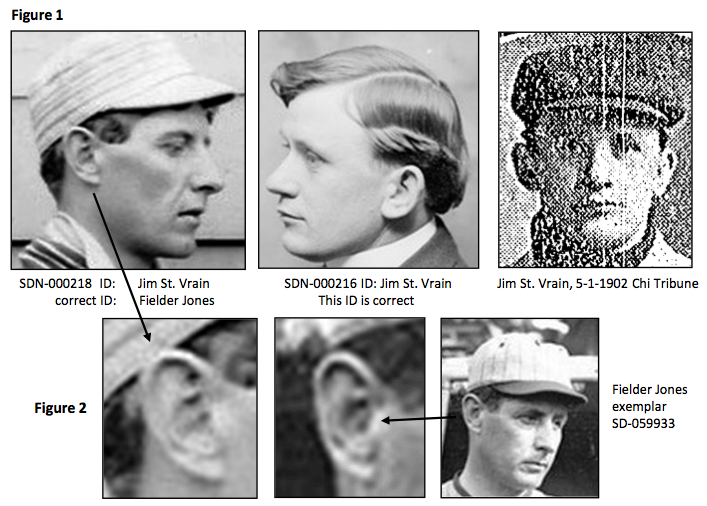 Figure 14 shows SDN-058181 which is correctly captioned as Davy Jones in a White Sox uniform at Comiskey Park in 1913. Jones’s only year with the Sox was 1913, hence the date is confirmed. Comparing the scoreboard billboards in Figures 13 and 14, it is obvious that the portions denoted by the pairs of arrows are substantially different. Therefore the Shawkey photo was highly unlikely to have been taken in 1913. 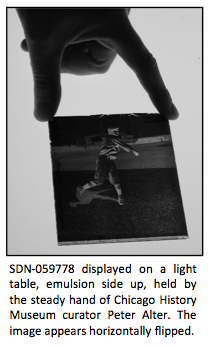 The photo of Figure 15, SDN-060197, does in fact depict Ed Klepfer in a White Sox uniform. Klepfer’s only season with the White Sox was 1915, so the asserted date is highly likely to be correct. Note that the pair of arrows in Figure 15 points to advertising that is substantially different from that seen in Figures 13 and 14. Also, CHM photos of Finners Quinlan and Bunny Brief in Sox uniforms (SDN-060196 and SDN-060211 respectively), both of whom spent only the year 1915 in Chicago, show the same billboard configuration as is seen in the Klepfer photo. Therefore the only fair conclusion is that the Figure 13 Shawkey photo was indeed taken in 1914. Why do we care? 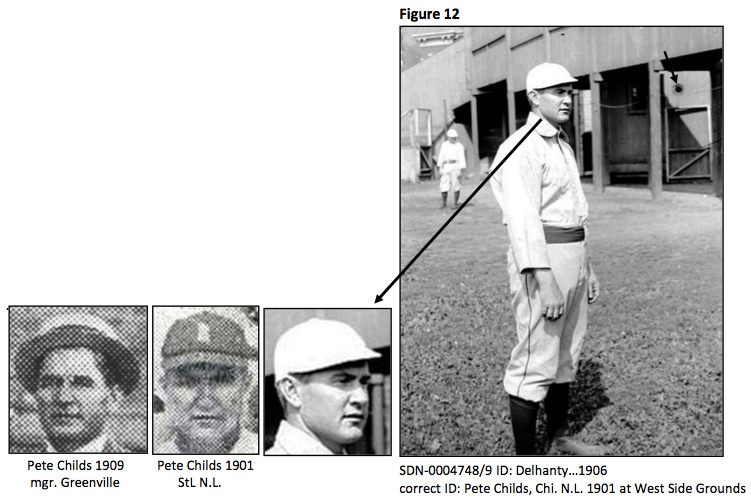 SDN-059778, shown in Figure 16, is claimed by CHM to depict Babe Ruth of the Red Sox at Comiskey Park in 1914. This claimed date is what is most significant here, and it is confirmed by the scoreboard advertising matching that seen in the Shawkey photo. Ruth appeared in only five games for the Red Sox in 1914. Other than poor quality old newspaper images, we haven’t seen any verifiable photos of Ruth in a Red Sox uniform in 1914. They are at least rare. Another photo claimed to depict Ruth as a 1914 Red Sox player had appeared on the “Sports Illustrated” web site (that caption has since been removed). The head cropped from that photo appears in Figure 17, left. At center is Ruth from the 7-30-1914 “The Boston Traveler.” Far right is Ruth’s head magnified from the CHM Figure 16 image. 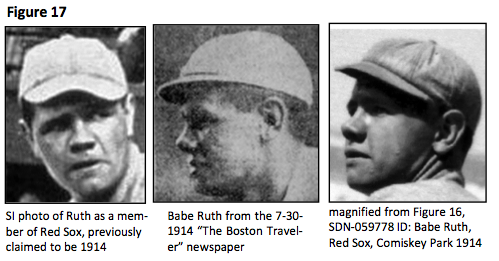 For the Boston Traveler and CHM photos, center and far right respectively, note the very short cap bill style. This changed to a more “modern” somewhat longer cap bill after 1914. This is evident from careful examination of various 1910s dated Red Sox team and individual photos. Ruth’s cap bill in the photo from the SI site (near right) is clearly of the more modern style. Given that and given no particular evidence that dates that photo to 1914, we can say that we know of no 1914 Ruth/Red Sox vintage photo other than SDN-059778. The Red Sox purchased Ruth from Baltimore on July 9. He made his first appearance in a game on July 11, 1914 against Cleveland. Ruth remained with the Red Sox until he was sent down to Providence on or about August 19. During this time-span, the only visit by the Red Sox to Chicago occurred during July 29-August 1. This is likely when SDN-059778 was taken. What value can be ascribed to this CHM glass plate negative? According to one major auction house, a good guess is $50,000 plus, with a six-figure result a possibility. Of course, other such photos may be found. Even so, SDN-059778 will remain a very valuable piece. A word searchable Excel file containing these same revisions is available from the Pictorial History Committee upon request. This will be a living document, with additions made over time. Comments and insight from readers are welcomed in this regard. Thanks to Bill Hickman and Matt Fulling for providing some of the corrections. Matt was particularly helpful with player IDs for some of the team photos. We’ve added a fair number of player IDs for team photos, though there are some that are yet to be studied. They will be addressed in the near future. MARK FIMOFF is co-chair of SABR's Pictorial History Committee. Contact him at bmarlowe@comcast.net. Sincere thanks to Chicago History Museum archivist Peter Alter for providing the author with general information about the collection and a fascinating behind the scenes tour. Thanks also to Steve Steinberg and Rob Lifson for their helpful comments. 2. Based on the CHM caption, SDN-002180 was misidentified as Fielder Jones in SABR’s Deadball Stars of the American League.